Look up dry goods in Wiktionary, the free dictionary. Exterior of a dry goods store in Burnaby Village Museum, British Columbia, Canada. Dry goods, in Commonwealth countries, is a term used to refer to dry food, with reference to pre-refrigeration days of the early 20th century. Such foods could be transported and stored without immediate danger of spoiling. Dried beans, flours, whole grains and rolled oats are examples. In the United States, dry goods are products such as textiles, ready-to-wear clothing, and sundries. In U.S. retailing, a dry-goods store carries consumer goods that are distinct from those carried by hardware stores and grocery stores. Dry goods as a term for textiles has been dated back to 1742 in England or even a century earlier. 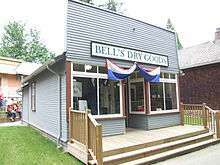 Dry goods can be carried by stores specializing only in those products (a type of specialty store), or may be carried by a general store or a department store. Beginning in the early 20th century, as many dry goods stores expanded into other lines of merchandise, the term largely disappeared from both everyday usage and the official names of the businesses concerned. 1 2 3 Cole, George S. (1892). "Dry Goods". A Complete Dictionary of Dry Goods. Chicago: W. B. Conkey Company. 19th-century book about fabrics. ↑ Definition of "dry goods" from Merriam-Webster. ↑ "Retail middlemen of consumer goods". marketing-howto.com.